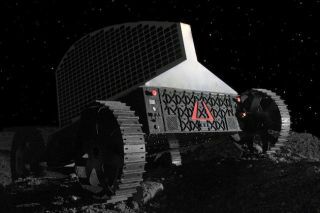 The Polaris lunar rover is designed to prospect for water ice on the moon. "This rover is a first step toward using off-Earth resources to further human exploration of our solar system," said John Thornton, president of the Pittsburgh-based robotics company, which unveiled the prototype Oct. 8. The lunar rover's power comes from solar panels designed to point toward the sun as it peeks just above the moon's south pole. A lack of GPS on the moon required a workaround. Astrobotic hit upon the clever idea of having the rover match whatever it sees on the surface with pictures of satellite images taken by NASA's Lunar Reconnaissance Orbiter.